Since Bruce Jenner revealed to the world that he is a transwoman, we’ve all been itching to see what he will look like when he finally becomes “her,” the woman he’s always been on the inside. In the groundbreaking Diane Sawyer interview, we got just a glimpse of what Bruce might look like as a woman. He took Sawyer into his closet and pulled out a slinky LBD with illusion sleeves at one point in the broadcast. We didn’t get to see him with the dress on, but we bet he looked just slammin’. We are still waiting for more details on Bruce’s transition, which we expect to be revealed once his 8-part docu-series airs this summer on E! 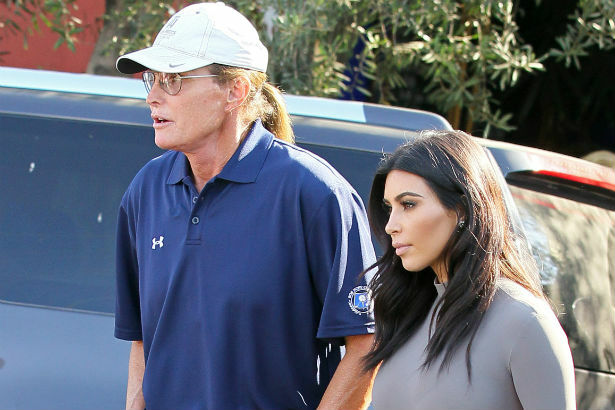 Of course, Bruce’s family has seen him as “her,” and Kim Kardashian, the member of his blended brood who has been most supportive of his transition, has all the tea on Bruce’s new look. Of course, we can’t help but wonder what Bruce was wearing, but we do know that Bruce has good taste. In a clip teasing part two of the Keeping Up with the Kardashians “About Bruce” special, Jenner confesses that he stole one of Kim’s outfits. Now that’s a “who wore it better” we’re dying to see (our money’s on Bruce).